Pharmacogenomics are formed by the words pharmacology (the study of the uses and effects of medications) and genomics (the study of genes and their functions). Pharmacogenomics is the study of how your genes affect your body’s response to medication. What is the Purpose of Pharmacogenomics? Do you know how your liver metabolizes the drugs you are taking? 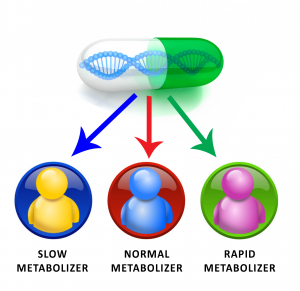 Are you a slow, normal or rapid metabolizer? Medication dosing amounts are based off normal metabolizers. If you are a slow or rapid metabolizer, this can drastically change the effectiveness and/or side effects of your medication. It may also affect how your drugs metabolize with each other. Your DNA sample will be sent off to a laboratory which will analyze for any genetic variants within the Cytochrome 450 family of enzymes. These enzymes primarily exist in the liver to help metabolize 70-80% of the drugs being prescribed today. 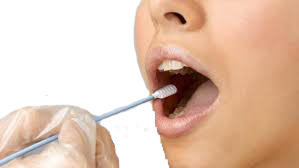 A cheek swab is all that is needed for testing. That’s it – simple and easy! Results of genetics combined with your basic demographic information, lifestyle factors, conditions and ailments you are being treated for and your current medication regimen are analyzed and available in approximately one week. The results are in a color-coded report and will validate if you are receiving the right medication, in the right dose, for the right diagnosis. Pharmacogenomic testing is covered by most insurance plans and Medicare.